Members may have noticed the trend to have one big article rather then several shorter. This is simply because it is less time consuming to research and edit one topic than several. This issue is largely taken up with an article on civil aviation in India and extended versions of Cards are out There and Worth a Second Glance – both in their different ways reflecting new material. 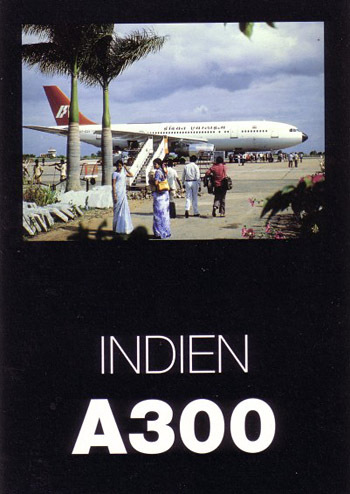 The lead picture kicks off the India theme with an early card from the Airbus series of an A300 at Bangalore airport. The Airbus VT-EDV was the 34th to be built and delivered in 1976, and the last of the fleet was scrapped in 2008. The active membership seems to be more and more concentrated around the airline/airport sector. This is evidenced by the fact that whereas an appeal for material for the Wright brothers centenary produced enough for a whole issue, the same for Bleriot produced nothing so images had to be sourced from the public domain, including PPM magazine. So, non-airline articles will always be especially welcome. Looking at Bill Bairds collection of new issues one might think that yellow was the new “in” colour but the fact is that the print images have under represented reds and greens.